Indulge in some nostalgia-filled goodness with these classic Zelda skins. Hyrule Warriors' pre-order incentive costume packs are now available for purchase via the Wii U eShop. A total of four packs are up on Nintendo's online store, three of which include costumes for both Link and Zelda: Ocarina of Time, Twilight Princess and Skyward Sword. The fourth pack, dubbed Demon King, provides an alternate skin for Ganondorf. If you want some Tetris in your life, you are running out of time! 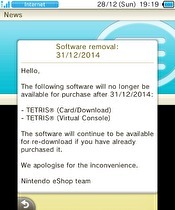 Two versions of the popular puzzle game Tetris will no longer be available after December 31 in Europe. This is what Nintendo of Europe announced in an update on the Nintendo 3DS eShop. Fans will be doing barrel rolls. High-end figure manufacturer First 4 Figures has just released a teaser for an upcoming Star Fox line of figures. Over the last few days, First 4 Figures has been releasing teaser images of upcoming products they plan to release in 2015. Today they showed off what is unmistakably an Arwing from Star Fox. 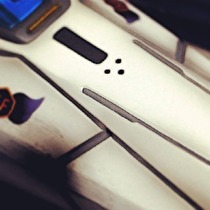 Further investigation leads us to believe that this figure will be based on artwork from Star Fox 64 3D. 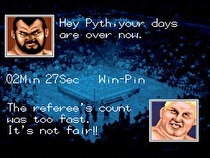 The Famicast crew's present to our loyal listeners, please to enjoy! 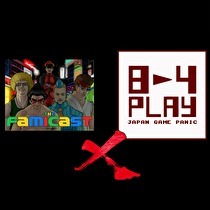 As mentioned on the latest episode of the Famicast, we have gone back through the past four live telethon recordings and edited the 8-4 Play X Famicast segments into regular episode length shows. All episodes are already available on the iTunes feed, although you may have to scroll down quite far to find them all. To make things a bit easier we have also included the episodes here as a direct download, so please enjoy them as you see fit! The 2009 hit can be viewed in stereoscopic 3D on Nintendo's handheld! 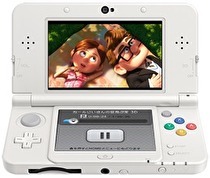 Disney's Up is now available on the Nintendo 3DS eShop in Japan for 3,240 yen. The movie can be viewed on the system with or without the 3D effect and is available with the Japanese dub. There is currently no word if any other full length movies will be released on the system or if Up will ever see a Western release on the 3DS platform. Yes, there were games released on Christmas. Lots of them! Stream all the anime you want right from Nintendo's console. Crunchyroll, the popular online anime streaming service, is now available on Wii U. The application can be downloaded via the Wii U eShop free of charge; however, you'll need to shell out for a subscription if you want to take full advantage of all the content available to premium members. Get a "helping hand" from some of your Amiibo in Kirby's 2015 adventure. The Amiibo for Kirby, King Dedede, and Meta Knight will give you a "helping hand" in Kirby and the Rainbow Curse. The Kirby Amiibo will let you star dash at any time, the Dedede one lets you wear the King's hat and get more health, and the Meta Knight one puts his mask on you and improves your attack. Along with the return of an old favorite. Two new rewards have been added to Club Nintendo in North America. First, there is a new Nintendo 3DS Game Card Case featuring covers based on Pikmin and Super Mario Bros. available for 400 coins. The second new reward is a NES Remix 2 T-shirt that costs 700 coins and is available in limited quantities. The retail chain is having a bit of a problem maintaining Amiibo preorders. Toys "R" Us is looking to remedy its Amiibo preorder cancellations by offering certain people chances to reorder the Amiibos it had previously ordered. Share your challenge-filled platforming creations online next year! Mario Maker, the upcoming Wii U exclusive, creation-centric 2D platforming game, will allow you to share your custom made levels online. We don't know if the service will update weekly once again. 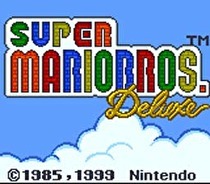 The Nintendo 3DS Virtual Console in Japan is finally getting a new game, the first since May of this year. This is what Joe Merrick, webmaster of Serebii, shared with us on Twitter. 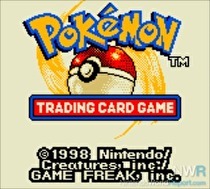 Pokemon Trading Card Game is the title in question, which previously released in Europe and North America back in July and November, respecitvely. It will set Japanese players back 617 yen and will release on the 24th of December. Lace your boots (or your busters!) up for this week's selection of downloads! Can't find Marth? Don't worry. You might be able to get a card of him. If you're unable to find certain Amiibo figures, you might be able to still use the character's features in games in another way, according to Shigeru Miyamoto in a recent interview. He didn't comment directly on the idea of discontinuing certain figures, but Miyamoto did clarify that figures could come back in another form. Mario's next big thing might not be on Wii U.
Mario is poised to star in a new game or take on a new role on Nintendo's next system. In a recent interview, Shigeru Miyamoto said he wants his creation to "usher in the next era." That next era is already being worked on, according to Miyamoto, as the company is already working on ideas for the next system. Unfortunately, there's no way to wrap it up and place it under the tree. The beloved NES classic Duck Hunt is making its way to Wii U Virtual Console in North America on December 25, Nintendo has announced. There is still hope for those who are looking to play Smash Bros. like it's 2002! Nintendo of America has promised to restock the Wii U Gamecube Controller Adapter as well as the Super Smash Bros. branded GameCube controller. 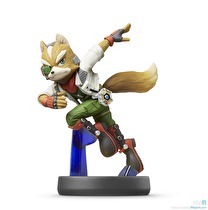 The support won't be major, but Amiibo will do "something" in each game. Amiibo will do something in The Legend of Zelda Wii U and Star Fox Wii U, according to Shigeru Miyamoto in a recent interview. While Miyamoto seemingly nixed the idea of Amiibo being a big part of either game, he did add "We do plan on doing something so that people who have Amiibo will get some enjoyment out of having Amiibo and using them in [Zelda Wii U and Star Fox]"
It's a subtle change but a change nonetheless. Bandai Namco has announced that its company name will be changed in the new year. Starting April 1, 2015, the company will be known as Bandai Namco Entertainment instead of Bandai Namco Games. In just over a week you'll be able to play WayForward's 2D platformer on your GamePad. Developer WayForward has announced that its 2D platformer Shantae and the Pirate's Curse will be releasing for Wii U on December 25. The game is currently available on 3DS but will be making the leap to console next week, complete with off-TV play, an unlockable Pirate mode, and multiple endings. Additionally, the Wii U version will support the Classic Controller Pro and the Wii U Pro Controller.